Adina Pitt and Jackie Edwards shared valuable insights in intimate MIPJunior sessions this morning. Here's what they said! 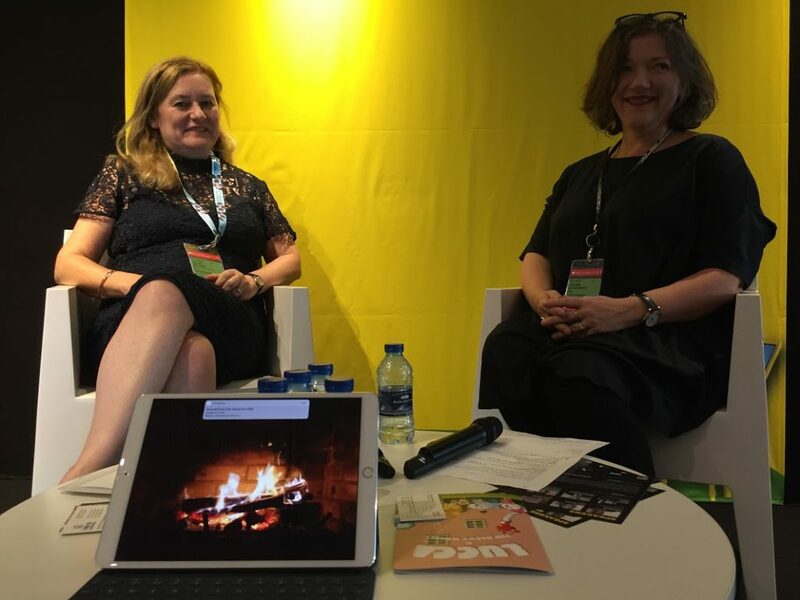 We were spoiled this morning at MIPJunior, with two rich Fireside Chats, featuring Cartoon Network and the BBC, both represented by members of MIP Markets’ Kids TV Advisory Board. Which is why collaboration is more important than ever. “People need to partner—with us, with each other, to build, so when you come to us we can accelerate faster,” Pitt emphasised. In Q&A, Pitt took the opportunity to respond to something Fred Seibert said yesterday—that little has changed in kids TV in 20 years, and you wouldn’t even know that Minecraft — an online building game and apparently the most searched-for term among young children — existed from the shows. Next up, Baynes interviewed Jackie Edwards, head of BBC Children’s Acquisitions and Independent Animation. There they are above, warming up by the fire. Edwards kicked off by explaining what’s changed at BBC over the summer: BBC Children has not only retained funding, but will also have an extra £34m coming over the next three years. “A lot of that funding was for us to get through the new digital world,” said Edwards, adding that BBC’s existing structure was designed with linear broadcast in mind. Now the focus is digital features, with more happening across different platforms. The result is that, a CBBC, more opportunities exist for extending brands across different platforms. In terms of commissioning, “We’re having conversations with producers about where we can do great brand extensions, where we can supersize those brands.” Flexibility is also key, so BBC isn’t picky about form length. “Ultimately, if your brand comes to the BBC, it will sit on pretty much every platform we have,” Edwards said. She cautions, “There’s lots of IP out there and lots of competition. With lots of broadcasters, there are fewer opportunities a year, so your idea has to really stand out from the crowd. Big ideas punch through” — so deliver that sizzle! One such example is My Petsaurus, a simple idea in which a child’s experience with their first pet is explored … except that this first pet is a triceratops. “It makes me laugh,” Edwards said. And next week, CBBC will launch Pablo, the story about a boy on the autism spectrum. When a distressing event occurs, Pablo draws himself into an art world and invents friends, who develop coping strategies to help him. Edwards also provided concrete information about what she’s looking for, and how best to pitch BBC. The headline alone will tell buyers whether there’s any overlap with what BBC already has in the pipeline. “Help us understand why we need [your content]on the channel, what it does for our audience that we’re not doing already. Sometimes you don’t know what you haven’t got,” Edwards added. For CBeebies: “We try not to be too prescriptive,” she said. “We pre-buy animation. If you’ve got a great, fantastic, big idea for preschool animation, that’s what we’re looking for. We love to laugh, so comedy is big.” Consider Hey Dougie if you’re searching for inspiration. As for CBBC? Think sitcoms, live-action, comedy dramas for 9-12-year-olds. “It’s all about the LOLs!” she declared. But specifically, she’s currently seeking a girl-led ensemble piece.